It has been a long-held belief that 50% of start-ups fail within their first year but that may no longer be the case. Recent studies have shown a much higher success rate for small businesses. The Small Business Association published statistics in 2016 that showed 78% of small businesses survive their first year which is a considerable difference and one worth noting if you are thinking of bringing your business idea to life. The increase of small businesses success can be due to a number of factors but the biggest influence has been the increase of technology available to help simplify business operations. Technology designed to aid businesses success has never been more accessible. Hardware like credit card machines and software like inventory management programs are now much cheaper due to the availability of these tools and the amount of competition between suppliers. These tools take what used to be complicated processes and make them simple to understand. This means that you don’t need to be an accountant or to hire one, you just need to know how to interpret the information within your finance software. Digital financial tools remove the need for complicated ledger books and allow everyone to become the financial director of their own business. These digital financial tools aren’t part of a new movement sweeping across the business world, they have been around for the better part of 30 years. Although, when computers and computer systems became more accessible and more user friendly, so did the digital financial tools. 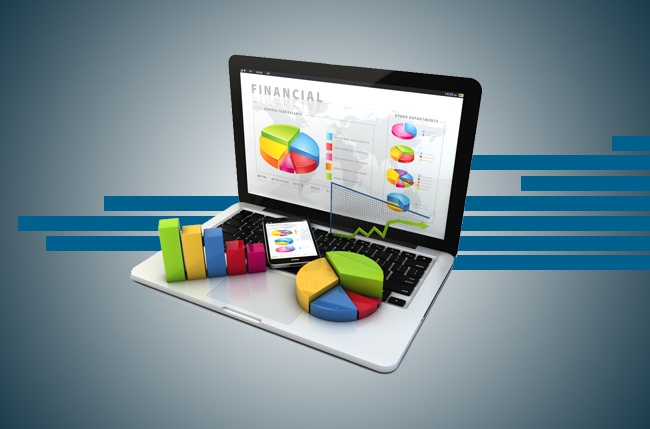 These days the majority of finance tools are cloud based which has many advantages over desktop software. Cloud software allows you to access your financial information anywhere, as long as you have an internet connection. It also allows you to collaborate with other members of your team no matter where they are. This works well for businesses that may not have a centralised office or if members of a team are often away on a business trips. As long as they have an internet connection, they can still gain access to the data. Cloud software also has the advantage of being cost friendly. Desktop programmes require an upfront purchase before you start using it. This may be an issue as the programme may not be right for your business and you won’t know this until after you part form your money. Desktop programmes often contain many features to suit all sizes of business but yours may never need those added features. Smaller businesses also may not have the ability to afford an upfront cost during their first few months of trading. Cloud software costs are generally dealt with on a month to month basis. This means that there is no painful upfront cost and you can assess if the software is working for your business each month. If it’s not, there is nothing stopping you from finding something else that works better. Cloud software also receives regular software updates and automatic backups. This not only keeps your information safe but allows for peace of mind. You will never have to worry about when the last time you made a full back up was. On top of all that, cloud software often comes with a great online support network. This means that in the unlikely instance that you have an issue with the software, you have immediate access to a team that can support you and help you get back in running order. There are many different product options available when choosing a cloud based financial software. You need to make sure that your financial needs are met but you also need to be sure that you don’t end up overpaying for services that you will never use. It is worth analysing your financial reporting requirements so you have a clear understanding of what you want from a cloud based financial system and so that you can identify what you don’t need or would never use. As a general guide, most businesses require software that can handle; accounting procedures, budgeting processes, payroll management, inventory management, expense tracking and billing. It may be more appropriate to choose a few platforms over one software that can incorporate all the functions. Many of these types of programmes will be able to connect and share data with each other anyway. Choosing to spread the duties among smaller, tailored programmes can help keep costs down and gives you more flexibility to change the way you deal with your business finance as and when your business needs change. You can also find some great tools out there that can not only pull all your accounts together to give you an idea of how your business is performing, but these programmes can do this through visual representation like graphs and charts. There are many programmes that give you the ability to view your information on mobile apps so if you are always on the move and would prefer to not have to carry your laptop, there will most certainly be some options out there that will transform the way you deal with your books. Whether you are a big organisation like Nestle-Good Food or a small business like Reid Brothers – Stainless Steel Banding, cloud based software can make a positive impact to the way you deal with your day to day finances. After all, business is about passion and bring ideas to life, not accounting. The easier we can make the boring stuff, the more time we will have to make our business dreams come true. When making plans for the future, it can be dissuading when we discover that there are companies out there who are merely looking to take advantage of us. However, the same can be true for any industry, and rather than shy away from the industry, we just need to be more educated when searching for a solution. Becoming familiar with the more unsavory acts a minority of companies try to carry out means that we will only be paired with a reputable and trustworthy Precious Metals IRA provider. This will ensure that you can confidently build a financial future without having to worry about a business failing or surprise fees. There have been companies in the past that have misled the customer into parting with their hard-earned cash into a Gold IRA rollover, then using the process to invest in rare proof coins. This is not in the best interests of the account holder, as the only coins that should be purchased are bullion coins. This is because the value of the gold held in a Gold IRA account is normally based on the gold content as opposed to their rarity. This kind of practice can cost investors a lot of money, and only look to benefit the company. Go to mineweb.net for a more in depth guide on gold IRA rollover process. When you purchase gold and have it stored with an official custodian, it’s normal practice for you to receive some certification to inform you this has been completed. If you speak to a company that is unable to offer this feature, then it could be advisable to avoid that particular company. That’s not to say that the company is not complying with what’s expected of them, but as an investor, we need to ensure that we’re able to safeguard ourselves where possible. If you’re not able to receive any confirmation that your account has been setup and your precious metals have been stored in the right way, then it could be that your account is not all it seems, and could consist of non-existent purchases. While it may be unbelievable, there are precious metal dealers out there that will sell customers shaved coins. Shaved coins mean that some of the gold content has been removed, which can only favor the dealer. As you can imagine, those who are subjected to such a scam will find that their investment is not all that it seems. Regardless of what service we sign up to, there can be mountains of paperwork we have to navigate through. If the paperwork is for a service like a cable or a cell phone plan, then it’s normal for many us to skim over the details and make a signature. However, we have to be a bit more vigilant when it comes to securing our future, especially from a financial standpoint. Read through the contract, and then read it again to ensure that the Precious Metals IRA company you plan to use is offering you the right kind of service. If you’re in any doubt, that it can be advisable to employ the services of an attorney who will help you ascertain as to whether the contract is genuine or not. If you receive a phone call asking you whether you would like to invest in a Precious Metals IRA, it can be a good idea to simply end the call. Why? Genuine Precious Metals IRA companies will very rarely cold-call complete strangers, if at all. Genuine companies will certainly follow up on any interest you may have shown in a Precious Metals IRA, but if you receive a call from a provider without ever making an inquiry, red flags should appear. The same can apply to door-to-door salespeople. While they may be genuine, it’s not a chance you should be taking with regards to your finances. While many may assume that checking of a Precious Metals IRA company can be complicated, it’s actually easier than you think. To ensure that you’re only dealing with a reputable company, you can check links and feedback via the following platforms. While it’s a not a necessity to ensure that the company has been in business for many years, it’s certainly something you should consider when making a decision. The reason for this is that you want to deal with a company that is both knowledgeable and experienced. This isn’t to say that the company who has been operating for less time is any less professional or reputable, but it can mean it may not have as many details about the industry as you’d like. Debt can have a huge impact on your personal life – from the stress of being contacted by creditors, to the strain which repayments can exert on your income. Studies have shown that struggling with debt can also have a profound effect on mental health, with anxiety and depression being the most commonly reported symptoms. The stress which debt can cause has the potential to affect most aspects of a person’s personal life. What is less often taken into account, however, is the fact that our personal and public lives cannot be separated. Personal problems with debt can easily spill over into the workplace, and have an effect on general working life as well as future career prospects. Problem debt, in extreme cases, can lead to bankruptcy – going bankrupt can have a massive impact in your choice of career, and put it on hold altogether if you work in certain sectors. Going through bankruptcy means that you cannot operate a business. If you already do, control of the company is transferred to a trustee and usually dissolved. Being bankrupt also means that you can no longer work as an Insolvency Practitioner, or in some jobs related to law, accountancy, or financial services. With these careers, bankruptcy causes you to be disqualified from the professional body you are a member of. However, once discharged from the bankruptcy proceedings, it is possible to return to these positions after a certain amount of time. Bankruptcy is usually a last resort for dealing with problem debt, but there are more subtle ways that dealing with less extreme debt can also have an effect on your career. Firstly, the stress which struggling with debt causes can have a real impact on productivity in the workplace. Employees who have problem debt are more likely to experience anxiety – it is virtually impossible to stop worrying just by going from a home to work environment. Money worries can distract employees from the task at hand, which is likely to reduce their productivity. On top of this, struggling with debt can have a negative impact on your career for more practical reasons. For example, if someone is being harassed by creditors, this is unlikely to stop simply because they have come to work. Taking time out of their day to respond to creditor phone calls or emails reduces the amount of time that an employee has available to work. Even a few minutes here and there can quickly add up to lost hours. The stress which such correspondence is likely to cause will also further knock a worker’s focus. Losing focus is problematic for most jobs, but for roles which involve a lot of physical work, or operating machinery, this can be dangerous as well as a nuisance. Long-term exposure to stress can also have a real impact on a person’s mental health. Interestingly, people who experience mental health issues are far more likely than the population at large to experience problems with debt. This is likely because mental ill-health makes managing your finances more challenging, which in itself can lead to debt piling up, hence further stress, and worse mental health. As well as this, many of the most common mental health issues – depression and anxiety included – generally lead sufferers to become more reclusive. As well as impacting personal relationships negatively, this also has the potential to affect professional relationships. As well as the smaller ways that problem debt can affect your daily working life it can also, sometimes, impede progress. For one thing, people struggling with personal debt, surveys suggest, are far less likely to consider a change of career – or even job – than their financially better off counterparts. Leaving a job with guaranteed, steady pay is a far more intimidating prospect when a large chunk of it is necessary just to pay the bare minimum on debts. As well as this, the reduced performance which the stress of debt can cause could prevent you from being selected for – or even motivated to apply for – promotions. As addressed earlier, serious problems with debt can undoubtedly prevent you from taking your career in certain directions too. Getting your finances under control could have a far-reaching impact on your professional life. The first step in overcoming debt is seeking help – it could be worth discussing any concerns with your employer’s human resources department if this is possible, or Citizens Advice if you are self-employed. You might consider getting IVA advice, as this debt solution allows you to write off some of your debt without many of the career restrictions imposed by bankruptcy. With an IVA, you can even continue to run a business. Debt can have surprising and extensive effects on career prospects, and levels of personal debt in the UK are on the rise. This means it is important for employers to be as supportive as possible towards employees who might be struggling with debt. Simple steps such as providing your employees with a quick debt awareness course can be a great way to encourage openness about problems, as well as decreasing the likelihood they will struggle with debt in the future. Hopefully, in a supportive environment and with the best advice, those struggling with debt will be able to focus on their work fully once again. Anyone who owns or operates a business will have some worry that crime will have a detrimental effect on its operations, but this is normally attributed to burglaries, unsavoury employees and vandalism. However, as the online world evolves, so does the role of a criminal. It should come as no surprise that crime occurs within the online hemisphere especially in the finance industry with so much secure data being at risk. However, there’s are millions of businesses who just aren’t prepared for the 2st century when it comes to cyber-crime, or don’t have the proper IT support services in place to handle such an attack. Many assume that hackers are some sort of mastermind, but the truth is that they look for loopholes in security and the information freely available, albeit from an online perspective. As such, not having the right kind of security in place is akin to leaving the doors of your business unlocked overnight. Similarly, the upsurge of cyber-crime can also dissuade business owners from adopting the Internet and the benefits it has to offer. While this is understandable, it shouldn’t stand in the way of expanding your business, you simply need to be aware of what precautions to take. Encrypting your data may seem like an obvious solution, but it’s a vital one to ensure prying eyes are locked of your business affairs. Some may not be aware that popular operating systems such as Windows and MacOS come with their own encryption, called BitLocker and FileVault respectively. The information on the device will be encrypted once a user has logged out of the system. Of course, those who forget to log out of their system could be open to attack. Fortunately, you can tweak your settings to ensure the device logs out automatically should there be no activity over a set period. This simple measure will ensure that your sensitive information is not giving potential hackers food for thought. While Wi-FI offers many benefits to business owners, it can also present its own set of problems if not implemented in the right way. Understanding the network being used can mean that you are able to do more when it comes to securing your data. When wireless was introduced, it was of course a new way of connecting to the Internet, so the fact that it had some shortcomings is not surprising. Wired Equivalent Privacy or WEP is a security algorithm which while potentially secure, has fell victim to numerous hackers. Wi-Fi Protected Access or WPA is a successor to WEP, and essentially offers a more secure network as a whole. If you have devices that can’t adopt the WPA network, it may be worth upgrading your equipment. You should also consider turning off your service set identifier (SSID) to create a hidden network, which will ensure that only users in possession of the network name will be able to connect. While having to log into a device each time you use it can seem inconvenient, it’s actually the way forward when it comes to protecting your business. Just as hackers prey on businesses online, they will also look to enter premises where hardware is held. Locking down the information contained within the devices ensures that company information isn’t falling into the wrong hands. You can also consider implementing a third-party who is experienced in ensuring that digital data is kept secure, as well as installing safeguards to help deter potential thieves. These can include specific data-encrypted devices that would be useless to a criminal, as well as additional feature such as snapshotting thieves via webcams and smartphones. Viruses and malware are nothing new to the online domain, but this doesn’t mean the threat has decreased. There are many avenues that can introduce unwanted viruses and malware into a business’s network. These can include emails, websites and social networks. Both viruses and malware have become more evolved and sinister, so while there is little a startup can do about such sinister introductions into the digital world, it can put itself in position where it’s less susceptible to attacks from unknown sources. This is why it’s important to ensure that we have antivirus and anti-malware software installed on all devices used within the business. Once the software has been installed, we then need to ensure that updates are installed as and when they’re released. This is because such updates are vital to combat current threats. Failing to update our software can be as detrimental as not having it all. A firewall is the bridge between your business and irrelevant data. Simply having access to the Internet can be a threat in itself, and those without a firewall are leaving their information to risk. Although we can do a lot to ensure we are only carrying out safe browsing, we can’t assume that this will always be the case. It’s also worth remembering that attacks are on the network as a whole, and not one particular advice. Having a firewall in place help syphon out unwanted attacks, often dealing with the problem before it ever occurs. Of course, to have the best line of defence, we have to have the right software installed. While the basic firewall that comes with many home systems will suit the everyday users, those who are running a start-up may want to invest in a more robust, business solution. Hackers have to get their information from somewhere, and in many instances, it can be located within Google, which means that your current web operations need to be amended. While a business has to ensure marketing material has to be promoted, this doesn’t mean the admin pages have to be. Using the robots-txt file ensure that the bots used by Google disregard ay pages deemed sensitive, making it more difficult for hackers. You can find out about such measures online. If you’re not too confident in carrying out the work yourself, then why not consider the services of a third party. When looking for ways to promote your website online, search engine optimisation is a term that will come up regularly. Many assume that SEO is something that can be undertaken by themselves, and in some instances, this is true. However, many have found that there are more benefits available to them when employing the services of an SEO agency. Although there is a slew of advice online when it comes to SEO, there still had to be a learning phase. This means that your operations could be minimal in the interim, only to find that everything you’ve learned in the last few months is now considered outdated. Using the expertise of an SEO agency allows you to take advantage of its experience and methods, that will have been fine-tuned and perfected over the years. This allows a business to hit the ground running, and start marking pathways in the online world sooner rather than later. Of course, we should have realistic expectations, and a reputable SEO agency will have no issue in advising the timeframe in which you can expect to see results. While there can be a lot of elements of SEO you can take undertake yourself, it’s not always about strategies. It’s also about being able to understand the customer, and what they expect from an online entity. For example, Keep SEO Simple an SEO agency in Scotland have had several years’ experience in dealing with many different companies, meaning that an SEO agency is a position to tailor your strategy to meet the demands of the modern-day consumer. To some, SEO can seem like a monotonous task that involves the same old practices. The truth is that the Internet is forever evolving, and the art of SEO is something that is always changing, albeit it for the better. Numerous search engine updates mean that customers are now offering content that is of value to online users. However, this is only the tip of the iceberg when it comes to marketing your company to new customers. Have you ever considered the opportunities social media platforms have to offer? Or maybe there’s a new technology that you wish to make use of. It’s not uncommon for SEO to work alongside marketing in many ways, and there can even be instances where the two overlap. Some may be under the impression that using an SEO agency is more expensive than hiring an in-house team, but it can actually be cheaper. This isn’t to say that certain businesses can’t benefit from an in-house team, but it’s about assessing what suits you and your company best. An in-house team can mean a constant expense that needs to be met, regardless of whether there is work available or not. Of course, you could advertise for a temporary role, but this isn’t very appealing to those who are looking for more security when it comes to their job role. An SEO agency is normally quite flexible when it comes to terms and conditions of the contract. While you should note that there is very little point in employing the services of an SEO agency for a month or so, as it’s unlikely it will be able to make that much progress in such a small amount of time. However, this doesn’t mean that you should have to continue paying for a service each month that you don’t need. Dealing with right kind of SEO agency will ensure that the service on offer is tailored to your needs, while staying within your budget. Some companies may only have a web presence because they assume that is all that is needed, but regardless of how great your website is, it’s not really serving a purpose if no-one is visiting the website. Using an SEO agency allows you to understand just how much opportunity your website can offer, and support you in finding ways of ensuring your website is generating a profit. Regardless of whether your website contains news, or sells the latest video game console, an SEO agency will know how to get the best from your website, ensuring that you’re generating a profit wherever possible. Whether we’re paying for a cheaper service, or implementing SEO strategies, there could be instances where the strategies being used are not having the desired effect. For example, those new to the world of SEO will probably read that a website can benefit from backlinks, and for the most part this is true. Backlinks are a great way of telling search engines such as Google what websites have linked to your business website. This could be in the form of sharing content, or even social media shares. However, the value is in the backlink itself, as opposed to how many there are. It’s not unusual to see one-off services that offer business owners hundreds of backlinks for their website, however if these backlinks are considered untrustworthy, then all it will really do is cause your website to decrease in popularity. An SEO agency will ensure that only white-hat SEO tactics are used, meaning that your site is optimised to meet with the regulatory requires of Google and other search engines. Using an SEO agency to carry out your SEO can mean that your website is gaining popularity sooner rather than later, while being optimised to ensure that rankings stay strong when it comes to search results.